The first time professor Sherri Mason cut open a Great Lakes fish, she was alarmed at what she found. Synthetic fibres were everywhere. Under a microscope, they seemed to be “weaving themselves into the gastrointestinal tract”. Though she had been studying aquatic pollution around the Great Lakes for several years, Mason, who works for the State University of New York Fredonia, had never seen anything like it. New studies indicate that the fibres in clothes could be poisoning waterways and food chain on a massive scale. Microfibres — tiny threads shed from fabric — have been found in abundance on shorelines where waste water is released. Now researchers are trying to pinpoint where these plastic fibres are coming from. In the first study of its kind, researchers at the University of California at Santa Barbara found that, on average, synthetic fleece jackets release 1.7 grams of microfibres each wash. It also found that older jackets shed almost twice as many fibres as new jackets. The study was funded by outdoor clothing manufacturer Patagonia, a certified B Corp that also offers grants for environmental work. “These microfibres then travel to the local wastewater treatment plant, where up to 40 per cent of them enter rivers, lakes and oceans,” according to findings published on the researchers’ website. Synthetic microfibres are particularly dangerous because they have the potential to poison the food chain. The fibres’ size also allows them to be readily consumed by fish and other wildlife. These plastic fibres have the potential to bioaccumulate, concentrating toxins in the bodies of larger animals, higher up the food chain. Microbeads, recently banned in the US, are a better-known variety of microplastic, but recent studies have found microfibres to be even more pervasive. In a groundbreaking 2011 paper, Mark Browne, now a senior research associate at the University of New South Wales, Australia, found that microfibres made up 85 per cent of human-made debris on shorelines around the world. While Patagonia and other outdoor companies, such as Polartec, use recycled plastic bottles as a way to conserve and reduce waste, this latest research indicates that the plastic might ultimately end up in the oceans anyway — and in a form that’s even more likely to cause problems. Breaking a plastic bottle into millions of fibrous bits of plastic might prove to be worse than doing nothing at all. While the UCSB study is sure to make waves, researchers are consistently finding more and more evidence that microfibres are in many marine environments and in large quantities. What’s more, the fibres are being found in fresh water as well. 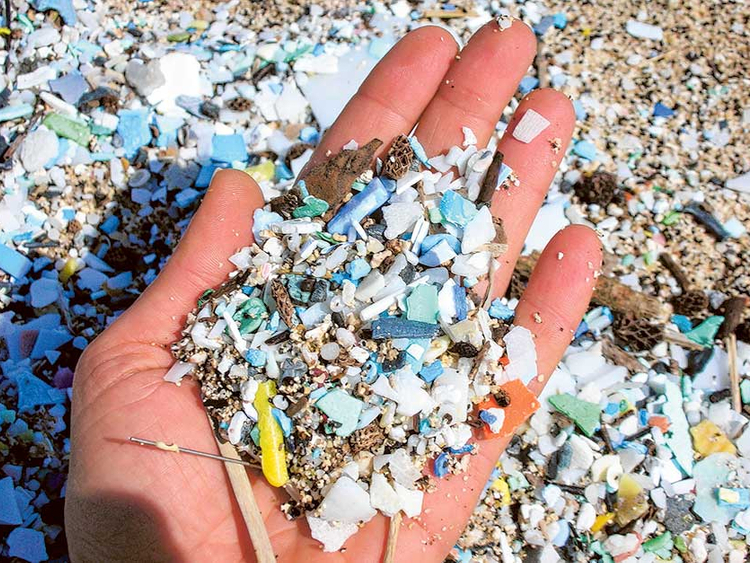 “This is not just a coastal or marine problem,” said Abigail Barrows, principal investigator of the Global Microplastics Initiative, part of the research group Adventurers and Scientists for Conservation. Of the almost 2,000 aquatic samples Barrows has processed, about 90 per cent of the debris was microfibres — both in freshwater and the ocean. Mason said her concern is not necessarily with the plastic fibres themselves, but with their ability to absorb persistent organic pollutants such as polychlorinated biphenyls (PCBs), and to concentrate them in animals’ tissues. Gregg Treinish, founder and executive director of Adventurers and Scientists for Conservation, which oversees Barrows’s microfibres work, said studies have led him to stop eating anything from the water. “I don’t want to have eaten fish for 50 years and then say, ‘Oh, whoops’,” Treinish said. His organisation received $9,000 (Dh33,057) from Patagonia to research microfibres this year. Rochman’s own recent study of seafood from California and Indonesia indicates that plastic fibres contaminate the food we eat. Testing fish and shellfish from markets in both locations, Rochman determined that “all [human-made] debris recovered from fish in Indonesia was plastic, whereas [human-made] debris recovered from fish in the US was primarily fibres”. Rochman said she can’t yet explain why fish in the US are filled with microfibres. She speculates that washing machines are less pervasive in Indonesia and synthetic, high performance fabrics, such as fleece, which are known to shed a lot of fibres, are not as common in Indonesia. Companies that have built their businesses on the environment have been some of the first to pay attention to the growing microfibre issue. Patagonia proposed the Bren School study in 2015, after polyester, the primary component of outdoor fabrics such as fleece, showed up as a major ocean pollutant. “We believe the outdoor industry is likely one of those [industries that contribute to the microfibre issue], but we just don’t know the breadth,” said Beth Jenson, OIA’s director of corporate responsibility. Miriam Diamond, an earth sciences professor who runs the University of Toronto lab where Rochman now works, said she believes so-called fast fashion could play a larger role than the comparatively smaller outdoor apparel industry. “What I suspect is that some of the cheaper fabrics will more easily shed fibres. It’s probably that the fibres aren’t as long or that they aren’t spun as well,” Diamond said. Inditex, which owns Zara and Massimo Duti among others, said microfibres fall into the category of issues covered by its Global Water Strategy, which includes ongoing plans to evaluate and improve wastewater management at its mills. H&M declined to comment on the microfibre issue, as did Topshop, which responded by e-mail “we are not quite ready to make an official statement on this issue”. Mark Browne, the researcher responsible for first bringing microfibres to public attention, said that the grace period is over. “We know that these are the most abundant forms of debris — that they are in the environment,” he said, adding that governments and industry must be asked to explain “what they are going to be doing about it”. The Amsterdam-based Plastic Soup Foundation, which works to address plastic in the oceans, said better quality clothing or clothing created from textiles coated with an anti-shed treatment could help. The foundation’s director, Maria Westerbos, said a nanoball that could be thrown into a washing machine to attract and capture plastic fibres also seems promising. Another solution may lie with waterless washing machines, one of which is being developed by Colorado-based Tersus Solutions. Tersus, with funding from Patagonia, has developed a completely waterless washing machine in which textiles are washed in pressurised carbon dioxide. Others suggest a filter on home washing machines. More than 4,500 fibres can be released per gram of clothing per wash, according to preliminary data from the Plastic Soup Foundation, an ocean conservation project co-funded by the European Union. But the washing machine industry is not yet ready to act. Jill Notini, vice president of communications and marketing for the Association of Home Appliance Manufacturers, said the washing machine could very well be a source of microfibre debris, but that the proposed solutions are impractical. For Plastic Soup’s Westerbos, the reluctance of the industries that operate in that crucial place between the consumer and the world’s waterways can no longer be tolerated. “It’s really insulting that they say it’s not their problem. It’s their problem, too. It’s everybody’s problem,” Westerbos said.